Paint by Sticker Kids has taken off! The four previous titles combined have 761,000 copies in print and are showing strong sales across a whole swath of retailers. 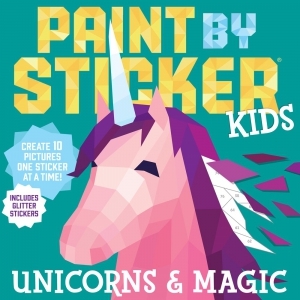 Now introducing title number five, Paint by Sticker Kids: Unicorns and Magic, hitting the sweet spot of fantasy, this Paint by Sticker title includes everything kids need to create ten bright and colourful illustrations of some of their favourite fairy tale creatures and settings. There are two colourful unicorns (which happen to be among the very top toy trends of 2018), a friendly dragon, and a delicate fairy. There’s a mermaid swimming with a school of fish. There’s a beautiful princess, a wise old wizard, a misty tower, and that familiar setting for so many classic stories, a snug little cottage. Creating sticker art is pure fun and a nice change of pace from markers and crayons. Simply find the numbered sticker, peel it, place it in the right space, and little by little, a mesmerizing fantasy image comes to life in the modern “low-poly” style that uses geometric shapes. The card-stock pages are perforated, so artwork can be easily removed for framing. Plus, there’s no mess to clean up! Young readers will love creating 10 bright and playful low-poly pieces of art featuring their favourite magical creatures, one sticker at a time. The boredom-busting fun of colouring meets the joy of paint by number and the interactive pleasure of a sticker book.